When traveling during our summer vacations or road trips taken throughout the year we always like to stop at historical sites or interesting museums to learn about our country’s history. 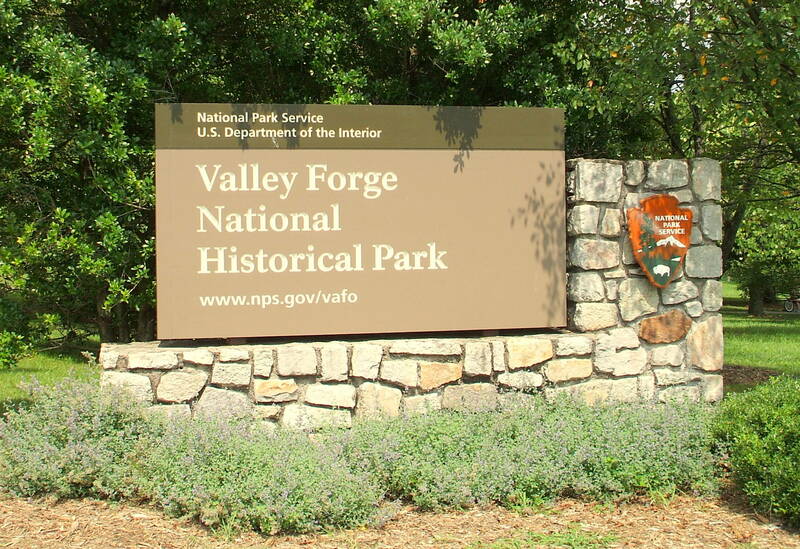 Valley Forge was one of those places on our list of things to see since it was such an important event in the history of the United States during the American Revolutionary War. While on a trip to Philadelphia, Pennsylvania in 2009, we also took a short 40 minute drive to Valley Forge which is located just 25 miles from downtown Philadelphia. (For more information on our trip and travel suggestions, please check out the link to the post Philadelphia, PA). 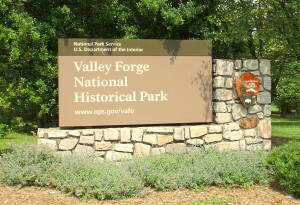 Valley Forge National Historical Park was the site of the 1777-78 winter encampment of the Continental Army which was under the command of General George Washington. 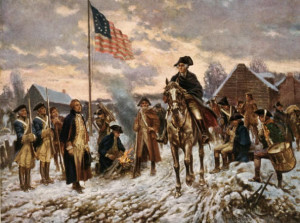 Some historians say that despite the harsh weather, limited food supplies and difficult living conditions, the Continental Army came through the severe winter with an unwavering spirit of patriotism and an increased determination to win our country’s fight for independence against the British in the Revolutionary War. While walking around the picturesque grounds of the Valley Forge National Historical Park in the summer of 2009 it was hard to visualize and fully understand exactly what Washington’s Army went through so our first stop after arriving was the visitor center. It is always a good idea when visiting any of our National Parks to stop at the information counter to pick up a park map and brochures and take the time to speak with a ranger for suggestions on places to visit and guided or driving tours that are available within the park. 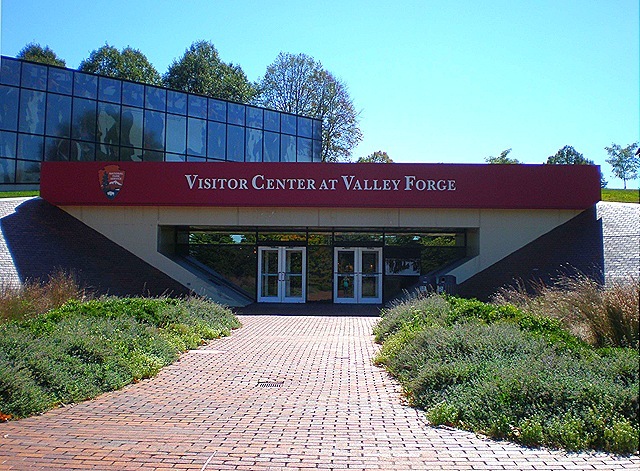 The Valley Forge Visitor Center also has a small museum with several exhibits pertaining to the Continental Army winter encampment as well as the Revolutionary War and the culture and natural history of Valley Forge. 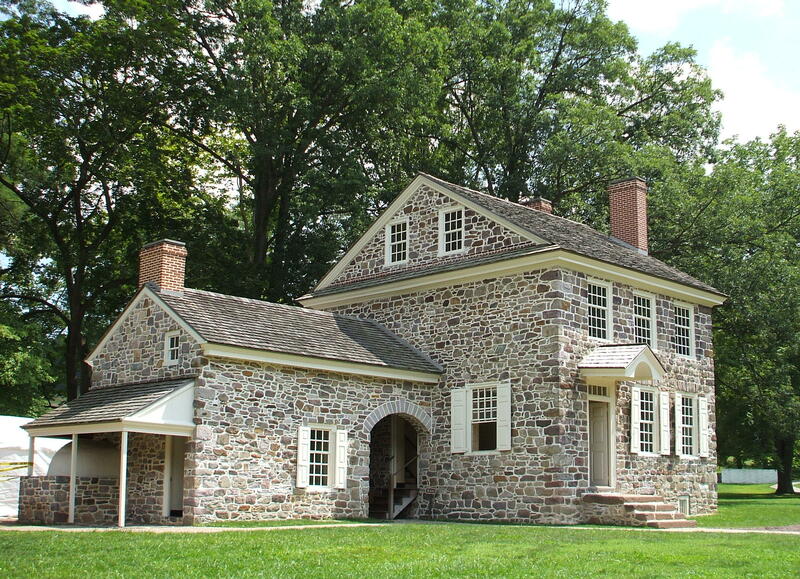 Before leaving the Valley Forge Visitor Center, be sure to get your National Park Passport book stamped and if you have children in your group pick up a Junior Ranger worksheet for them to earn their Junior Ranger badge at the end of your visit! Washington’s headquarters – This 18thcentury stone building was used as the headquarters for General George Washington during the six months of the winter encampment of the Continental Army. The exterior and interior of the building have been fully restored and the interior is furnished with period pieces, artifacts and exhibit items pertaining to the use of the building by Washington and his staff. Soldier’s cabins – Reconstructed soldier cabins are located in several areas of the Valley Forge National Historical Park. 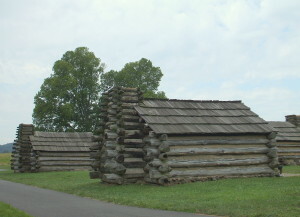 About two thousand cabins within the encampment were laid out in parallel rows. In general, the cabins measured approximately 14 feet by 16 feet with a door situated on the south side to allow the sun to heat the cabin during the day. 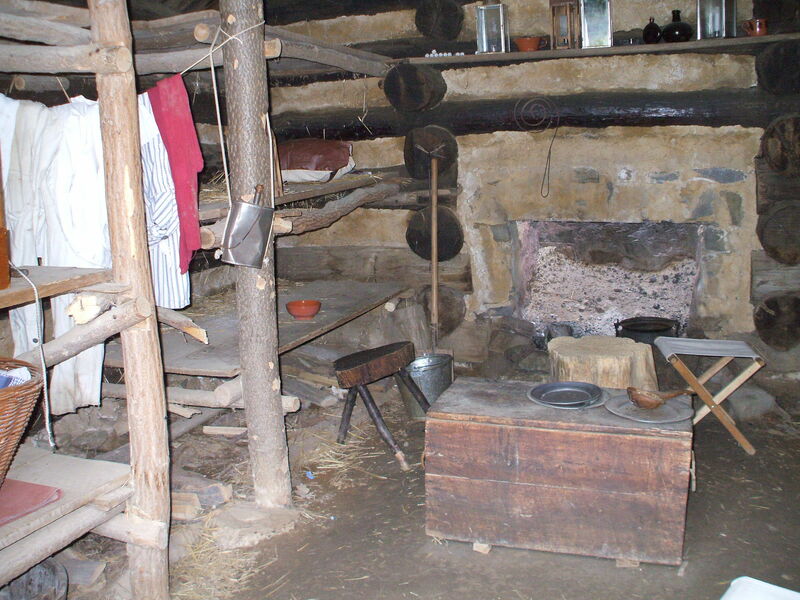 Roofs were constructed in a variety of materials but oak shingles proved to be the best for insulation. Wooden fireplaces were lined with 18 inches of clay to prevent a fire hazard. 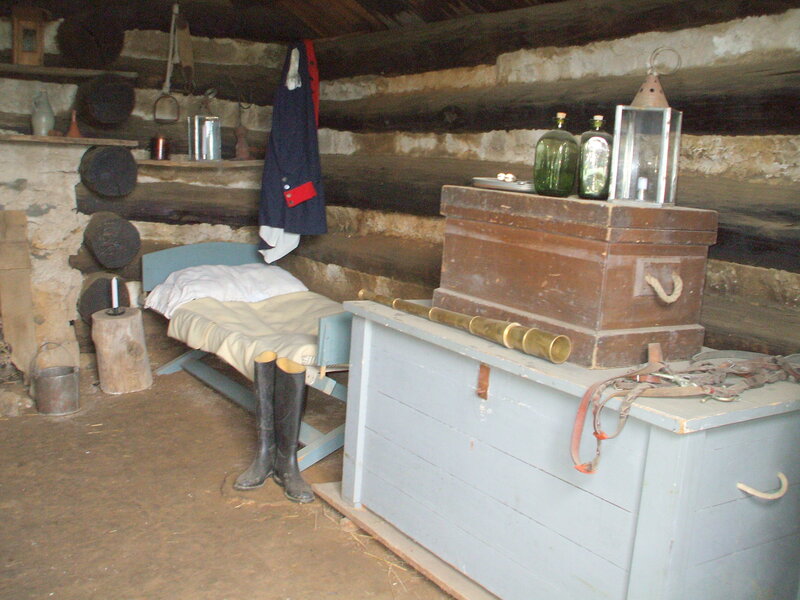 The cabins housed either twelve enlisted men, six junior officers, three staff officers or one general. 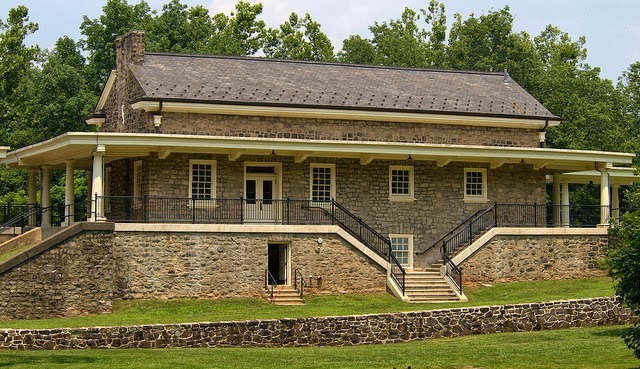 Valley Forge Train Station – The train station is located on a hilltop overlooking the Schuylkill River and construction was completed in 1913 for use by the Reading Railroad, at that time passenger rail excursions were popular with the general public. 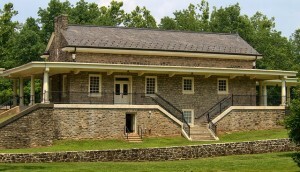 Currently the train station is the site where guided-ranger tours of the nearby Washington Headquarters start and within the building there are several exhibits. 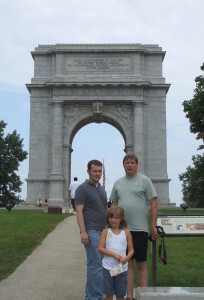 Valley Forge Memorial Arch – The Arch was erected in 1910 and the inscription on the front of the Arch reads, “To the officers and soldiers of the Continental Army December 19, 1777 to June 19, 1778”. Inside the Arch are both the front and the back of the Great Seal of the United States. There are many other inscriptions on the memorial, such as a list the names of the Generals that fought in the Revolutionary War and on the back of the memorial is a quote from George Washington which reads, “Naked and starving as they are, we cannot enough admire incomparable patience and fidelity of the soldiery”. Baron Friedrich von Steuben statue – Within the Valley Forge National Historical Park there are many other monuments and statues. 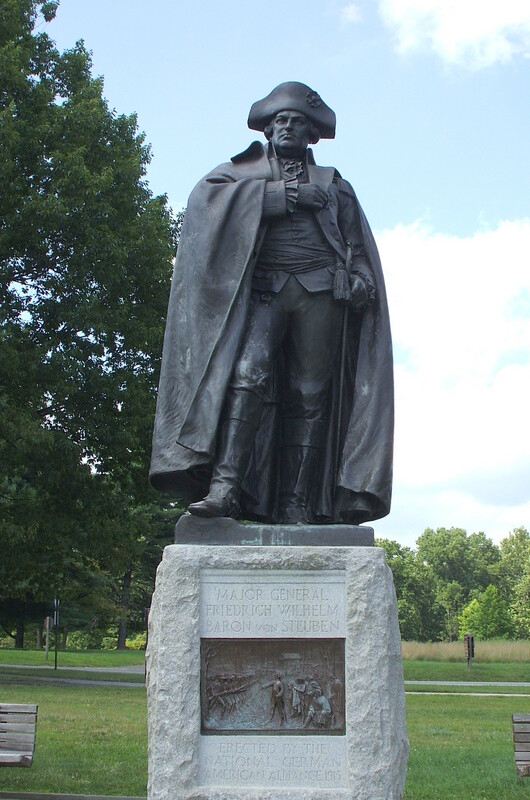 One important statue is dedicated to the former Prussian Army Officer named Baron Steuben. He has been credited with training the Continental Army during their winter encampment at Valley Forge into a more efficient military force. The original story of Valley Forge was a very careful constructed tale told after the Revolutionary War to teach the American people about perseverance. It recalled the suffering of the Continental Army during their winter encampment from 1777 to 1778. With harsh weather and miserable conditions caused by inadequate clothing and limited food supplies, the soldiers were transformed during that six month period and they became strong in patriotic spirit and able to fight with renewed vigor for the cause of liberty and independence. Traditionally as the winter months came, the normal course of military action at the time called for battles and military maneuvers to stop and the armies would withdraw into winter encampments. In the third year of the American Revolutionary War, the British had recently captured Philadelphia and Washington decided to set up camp in Valley Forge which was a location close enough to Philadelphia to maintain pressure on the enemy yet far enough away to prevent any surprise attacks from the British troops. 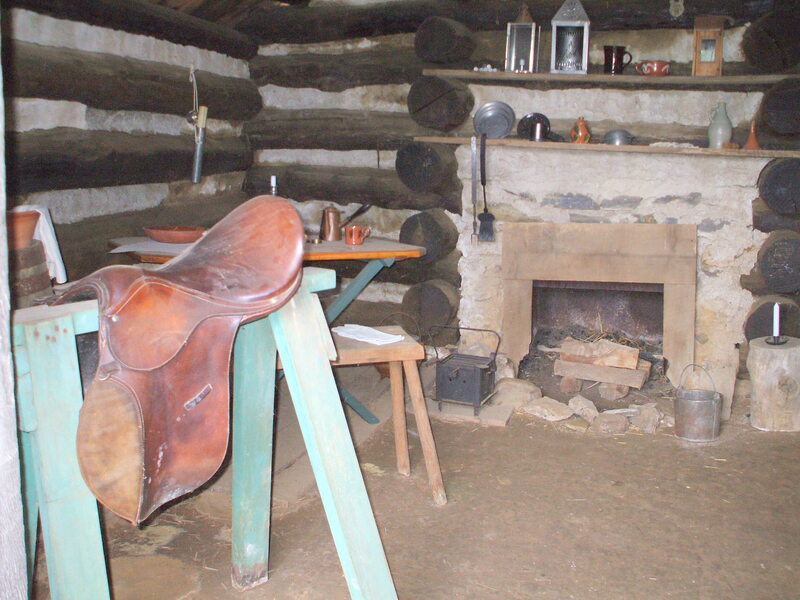 As Washington’s Continental Army entered Valley Forge in mid-December of 1777 they found a vast area cleared for spring crop plantings and large open spaces used for animal pastures with nearby woods that would provide building materials for housing and timber for heating purposes during the upcoming winter months. Washington ordered log cabins to be built to house the troops and officers from the cold weather and trenches and earthen fortifications were built for a line of defense against the British. It has always been depicted that the Continental Army suffered unusually harsh weather conditions, but according to the records at the time the temperatures were on the average 33 degrees during that first month of the winter encampment, December 1777 to January 1778. Supplies to the troops were also very limited because the supply wagons were delayed due to muddy roads and rising rivers that were difficult to cross due to heavy rainfall. 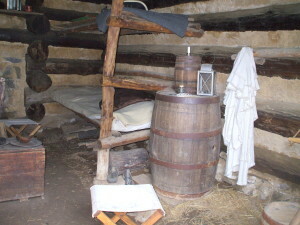 Despite the delays, the soldiers looked to alternative resources and began foraging for food within the area and making clothing from rags to keep them warm during the winter months while many of the soldiers lacked shoes because they were destroyed during long marches and blankets were scarce. Eventually Washington commissioned the Continental Congress to fund the war effort and by February 1778 food, clothing and military supplies started to arrive in Valley Forge. Sadly, most of the casualties and deaths of the soldiers was not from cold or starvation but from diseases such as influenza, typhoid and dysentery during the warmer months of March, April and May 1778. By the time former Prussian Army Officer Baron Friedrich von Steuben arrived in the encampment in February 1778 the Continental Army was ready to become a more “professional” military force. During the following months Steuben directly trained the army to become a more efficient military unit with improved weapon skills and marching precision. As a result by June 1778 the Continental Army had a new confidence that would sustain them in their fight for independence from the British.